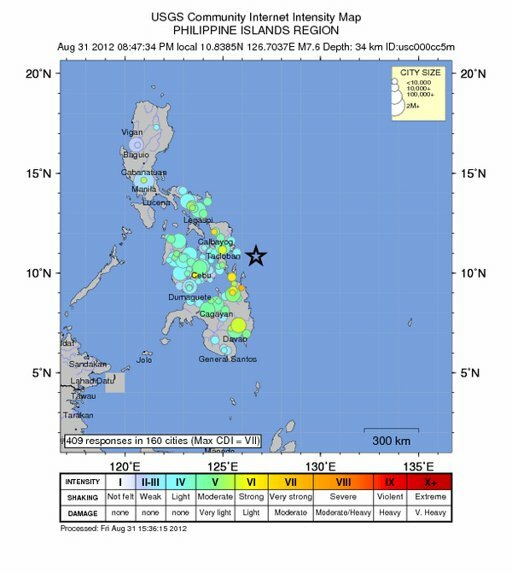 Magnitude 7.9 Earthquake Hit Philippines August 31, 2012 - How Did You Feel It? "We're at our office and we really feel it shaking. It's just like the earthquake last February - Cebu"
The United States Geological Survey detected the magnitude 7.9 earthquake 139 kilometers east of Sulangan, Eastern Samar. 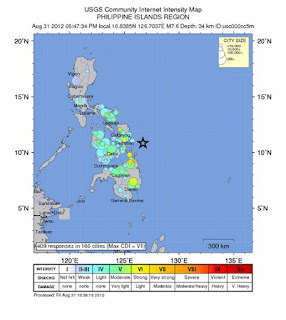 The Philippine Institute of Volcanology and Seismology measured a magnitude of 7.7, however. This prompted the Pacific Tsunami Warning Center in Hawaii to issue Tsunami Bulletin Number 001 raising a tsunami warning. As of 9 pm, tsunami warning has been issued for the Philippines, Indonesia, Belau, Yap island, Taiwan, Japan, Guam, Northern Marianas, and Papua New Guinea. PTWC made clear, however, "it is not known that a tsunami was generated." It issued the warning because "an earthquake of this size has the potential to generate a destructive tsunami that can strike coastlines near the epicenter within minutes."